Over the last four years, Nixeus has launched a number of products focused on the gaming market. While the initial focus was on high-resolution monitors, they have now started to include gaming keyboards (mechanical) and mice in their portfolio. In addition, they have also been at the forefront in supporting AMD's FreeSync variable refresh rate technology in their monitors. Last month, they introduced a 'Pro' version of their 27" WQHD (2560x1440) IPS monitor. The new monitor will be sold under the NX-VUE27P model name, with the 'P' indicating that the professional market is being targeted. The 2560x1440 monitor supports 100% sRGB color gamut, while also claiming AdobeRGB support. 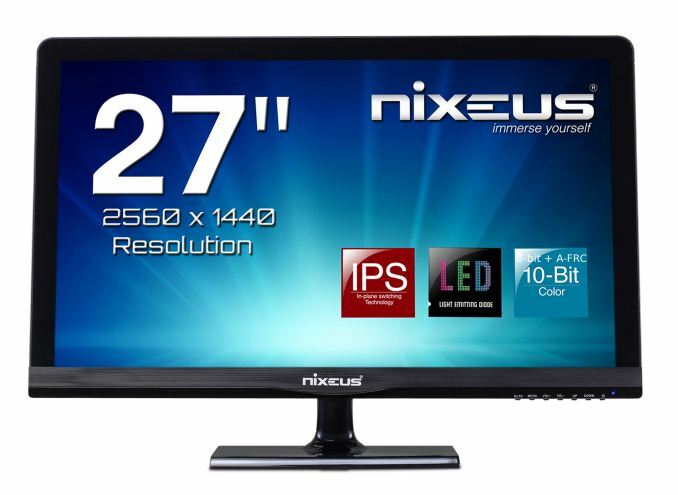 Except for the latter aspect, the display of the Nixeus PRO Vue 27″ AH-IPS 2560×1440 Mac/PC monitor is identical to the Nixeus VUE27D that we reviewed back in late 2013. Given the review link, I will not go into the details of the brightness, contrast ratio, response time etc of the NX-VUE27P. Unlike many of the vendors that we talk to, Nixeus is quite transparent about the hardware choices they made while designing the product. The panel model and the scaler can be easily found by anyone with access to the hardware, but, Nixeus saved us the trouble and indicated that the NX-VUE27P uses the same panel as that of the NX-VUE27D, the LG LM270WQ1-SDF1. While the NX-VUE27D had only a DisplayPort input (enabled via a MStar scaler), the NX-VUE27P adopts a more recent Novatek scaler that enables additional features - multiple display inputs (DL-DVI-D, DP 1.2, HDMI and VGA), and a mode that can activate the 8-bit + A-FRC feature of the panel ('10-bit' mode). This '10-bit' mode allows Nixeus to add an additional OSD option for AdobeRGB color gamut. Despite this option, the panel capabilities dictate that only around 78% of the AdobeRGB color gamut can be covered by the monitor. The NX-VUE27P also has in-built stereo speakers and a 3.5mm audio jack (for use with VGA and DVI connections). The MSRP is $400, but the current street price seems to be around $390. The monitor carries a 2-year warranty.